Okay. Last year, I finally wrapped up writing about every single Father MC 12" single. But that doesn't mean the fun has to stop. There's still plenty more of his oeuvre to explore and discover. 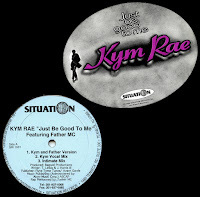 In fact, I bet y'all never heard of this one before: Kym Rae featuring Father MC: "Just Be Good To Me" on Situation Records from 1996. Now, Situation is located in Teaneck, New Jersey; and career-wise, 1996 would situate Father after that whole Moja/ Spoiled Brat mess, but before he moved to Florida and hooked up with Uncle Luke. So that all makes sense, right before his single on Echo. Kym Rae was an R&B singer, not a rapper; but the type who was very tied to working with Hip-Hop acts. She was being produced and probably managed by Redhead Kingpin and had done songs with K-Def, Sadat X and McGruff. She was meant to have a full-length album in 1997, including this song; but it never came out. Later on, she came back and signed with Renegade Foxxx's Still Hustlin imprint, but he never put out any records by her, so she basically just wound up singing a bunch of his hooks. So, anyway, "Just Be Good To Me" was Kym's first single, and yes, it's a syrupy cover of the S.O.S. Band's "Just Be Good To Me." You know the one, "I don't care about your other girls..." or, if nothing else, you've surely heard a million and one songs sample the line, "people always talkin' 'bout... reputation." Yeah, it's that song. But where the original was catchy and funky, this is going for a slow, smooth but 90s tip. By 90s tip, I mean that "Real Love" style of lacing a traditional Hip-Hop breakbeat under the whole thing. In fact, it's the very same breakbeat: "Impeach the President," this time with an extra piece of MC Shan's "The Bridge" still married to it. So, it's not exactly an exciting record. A song that's been covered a hundred times already with a derivative production style. But it still sounds good if you're in the mood for a very 90s R&B groove that doesn't aim particularly high. Kym doesn't stretch herself much vocally either, by reaching impressive high notes or challenging ranges. She just softly sings, relying on her admittedly nice voice. It seems surprisingly low effort for someone trying to make a name for herself with her first single, but it's definitely not bad. But what about Father? That's who we're all here for, right? Well, me anyway. Well, he's got two verses. A real quick opener, than he comes in with the more traditional R&B guest verse in the third act. It's... not his best stuff. he really sounds like he's trying to imitate the trends of the day on this, opening with the line, "I keeps it hot; on the real, I keeps it raw. Father freaks the flav; I kick game out the back door." Like, Father MC in his prime would never have said "keeps" or "flav." And even if you're not a fan, you have to admit, Father MC had established himself and found enough of his own voice by 1996 not to have to try and fit in with the youngsters. On the plus side, though, he doesn't just throw in a quick verse that has nothing to do with the concept with the song at large. She's singing to her man about how she doesn't care that he's a player, and he portrays that player. Of course, he's spent entire albums rapping about being a player, so it's not exactly a stretch. But it's actually smartly written how he comes back in his second verse to explain how he will treat her just like she's asking for: "I'm gonna bless your finger, get you laced in white; feed your appetite tonight as I serve ya right. Have Versace Victoria's Secret; peep it, a spread of white roses on silk satin covers, what? I go all out 'cause you be representin' me; I be representin' you. Don't change, Boo. I feel blessed." It's nice how it all works together instead of pulling in opposite directions like these collaborations often do. Now, this 12" has a couple versions on it. And like the name of the Kym and Father Version implies, most of the others don't feature Father MC. Situation's an indie label, but there was a music video for this, and Father ain't in it. If the album had ever come out, presumably he wouldn't have been on there either. This is just a remix single. On this single, it's the Kym Vocal Mix. Then there's an Intimate Mix, which contrary to its name actually has some bouncier, subtle but more cheerful instrumentation. Interestingly, Kym's Bonus Beat also features Father and Kym's vocals - is this 12" mislabeled, possibly? 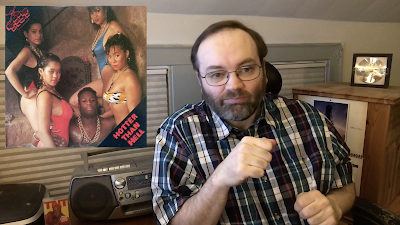 Anyway, the difference is the track on this one is more stripped down, putting the Hip-Hop beat more prominently and doing away with most of the extra R&B keyboards and music. Then the Original Bump Demo Mix is just what it sounds like, a slightly less polished recording with all the same elements, but an extra "bump" kicking through the percussion and some very minor variations and a little acapella finish. And finally, the Instrumental is an instrumental of the main track. Frankly, none of the variations actually vary enough to make them worth bothering with. There's basically the version with Father, and the one without for people who hate rap. The rest is all excess; and as you can see, the 12" comes in a sticker cover. The song is fine, but nothing to get excited about. I mean, you're still better off just listening to the S.O.S. Band's original. The world doesn't really need all of these knock-offs and cash-ins. But as far as they go, this one's pretty listenable and inoffensive. And if you're a fan of Father's, maybe even a little charming.